Today we’ve got another new tangle from West Virginia tangler Beth Snoderly, her first of 2016, named Bep. This is Beth’s 25th tangle in our collection and she’s also contributed quite a few strings as well. Bep is a very special tangle to me. It came from a divider between booths in a Red Lobster. Bep is my Dad’s nickname for me. So I decided to name it in his honor. Bep is an easy grid-based tangle with so many possible variations for fills and shading. For my example I used the variation in the upper right corner of Beth’s Step 6 below and added a little graphite fill. 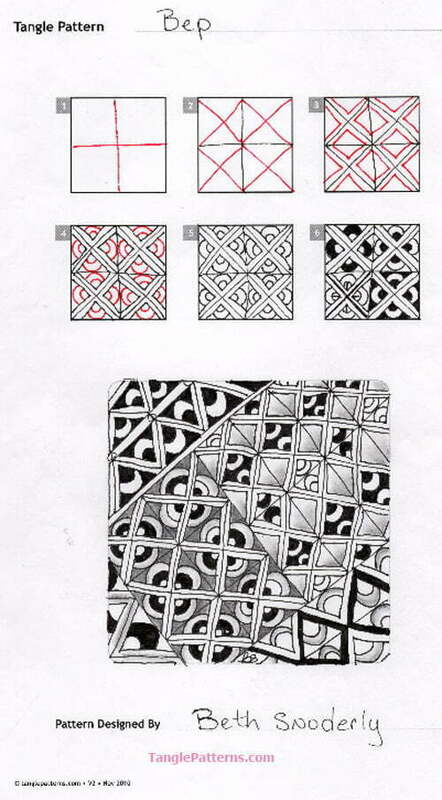 Beth illustrates the step-by-step instructions for drawing Bep below and in her finished example monotangle tile she shows several ways to vary her tangle . These additional images show ways Beth experimented with various fills and shading for Bep. 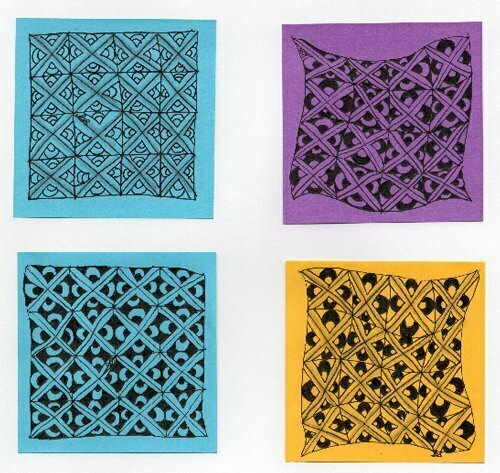 The first set is on colorful Post-it® notes. 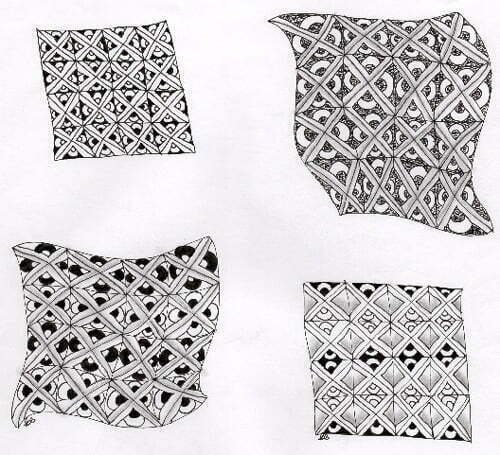 Beth’s second set of examples are in our traditional Zentangle® black and white. So many possibilities! Can’t wait to use this. Thank you Beth!! Hi Beth! I always love to hear where people draw their inspiration. I have gotten strange looks as I pull out my phone to take a picture of a pillow or design on some article of clothing. What I love about this design is what happens to the pattern when you curve the surface. Hi Beth. Thank you for sharing both your tangle and your story! I live just outside of Vancouver, BC, Canada, in Maple Ridge, and we don’t have Red Lobster here but in Alberta they do! I’m going there on Saturday for a couple of weeks and hope to visit a Red Lobster again. Maybe I’ll see what inspired you there. Hi Beth, I am very new to drawing tangle patterns and I was very intrigued when I came across this tangle called BEP as it is also my husbands nickname given to him by his Italian parents. I look forward to trying this tangle. I am loving this new passtime and look forward to discovering more of your tangles. Thank you! Great tangle Beth and so many variations… Can’t wait to start playing! Love the post it notes idea. Thanks.